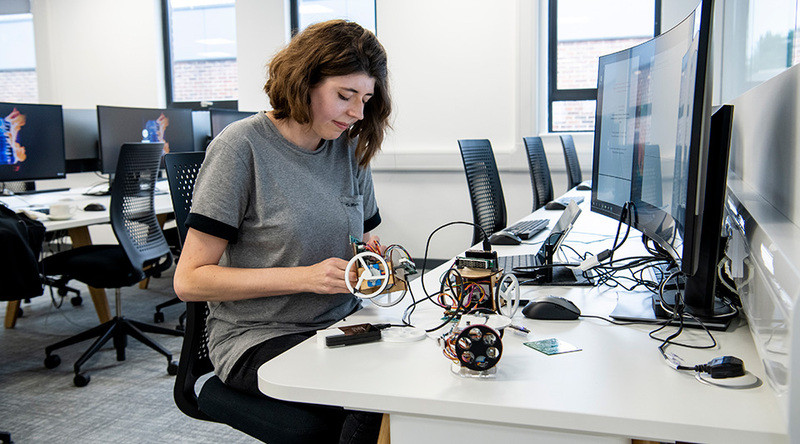 Opened in Autumn 2018, the software projects laboratory offers world class facilities and equipment specifically for senior undergraduate and MSc students. It is a versatile area for industrial led projects and comprises four complementary areas to facilitate the project life cycle from initial concept through design and testing to a functional prototype. The facilities are underpinned by in-lab support from specialist technicians and academic staff. 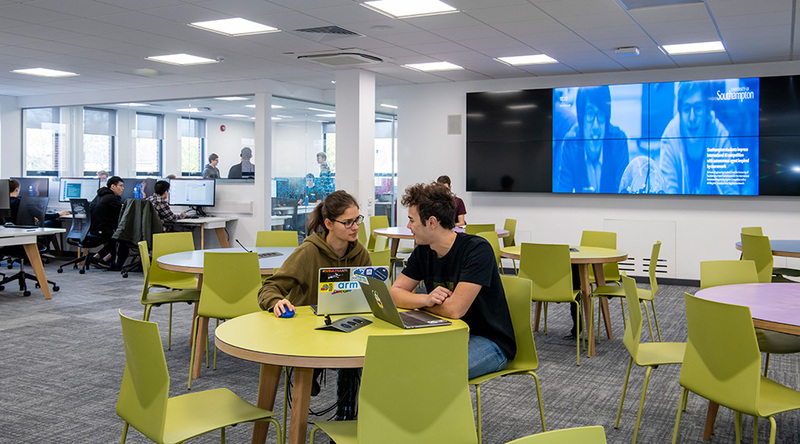 The four areas comprise a high-performance computation suite, group working spaces, specialised meeting rooms, and quiet study areas. The computation suite is configured with powerful PCs and high-resolution 38” screens to support demanding computational work, but also provides ample space for students to bring in and connect their own laptops. The group working spaces are provided in two central areas with desks that can be used flexibly by individuals or groups; several wall-mounted 55” interactive screens are available for ad-hoc presentations, brainstorming and team work, while an eye-catching 5m x 1.4m video wall enables our students’ best work to be showcased during formal events and project demos. 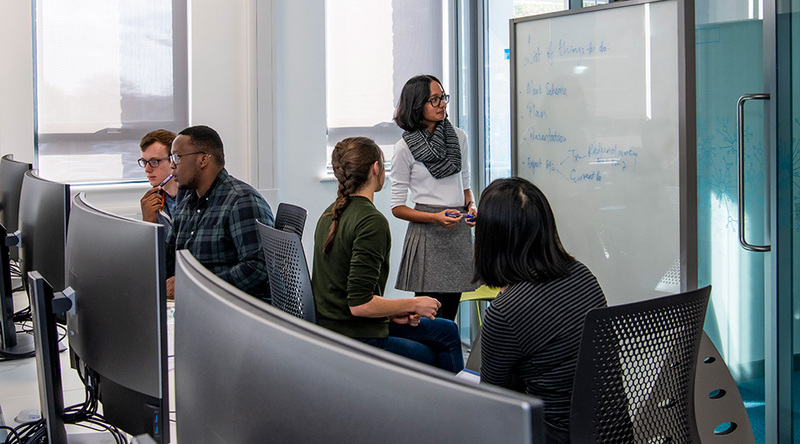 Four meeting rooms can each accommodate project teams of up to six students and also feature 55” interactive screens; two private booths offer a further option for phone/teleconference calls. Finally, for those seeking minimal distraction, there are four separate quiet areas which are configured to support both dedicated PCs and laptops. 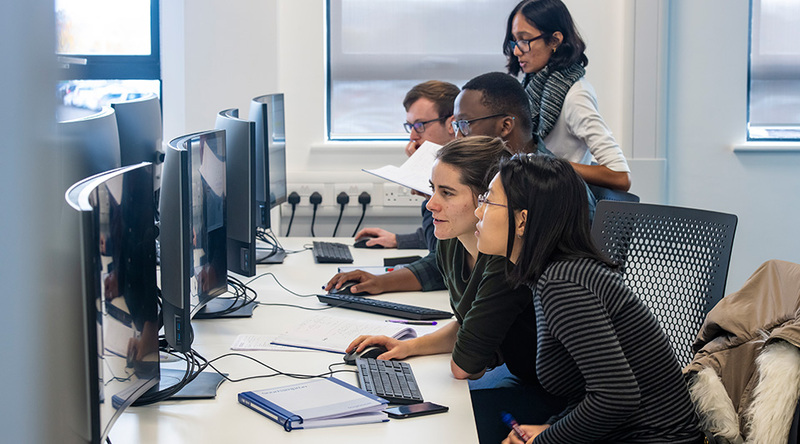 These labs provide essential practical experience to consolidate taught theory in industrial applications, helping students develop valuable employability skills and broad engineering industry awareness. This space is dedicated to undergraduate and MSc project work only. The group project work undertaken in the labs facilitates contact and networking opportunities with our industrial partners, providing valuable transferable skills and knowledge which make our students among the most sought after in the sector.